Paper and cloth 1 1/4 fl. oz. Handy no-sew adhesive that permanently bonds fabric to fabric. Drys clear and flexible. Fast drying and washable. Great for costumes, home dec and craft projects. Works on all weights of fabric from very sheer to heavy duty. Protect work surface with a paper towel. Unscrew cap. Tube is ready to use.Use a straight pin to clean clogged nozzle. Replace cap when tube is not in use. Gently squeeze tube from bottom directly onto back of fabric. Smooth adhesive with finger or small brush. (Washes off finger easily) If hemming or positioning an applique apply adhesive within entire hem or applique area making sure adhesive is spread evenly to outer edge of fabric. Use gentle finger pressure to position applique or overlap hem. Allow bond to set a few minutes then apply heavy finger pressure and allow to set 30 minutes before ironing or wearing. DO NOT WASH FOR 24 HOURS AFTER BONDING Metal hair clips are ideal to hold hems or applique in place while adhesive sets. Pins can be used on heavy fabrics, but DO NOT PIN LIGHT WEIGHT OR 100 PERCENT POLYESTER FABRICS as the heavy finger pressure needed to place pins causes seepage. TIPS- light application for sheer and light weight fabrics, Medium for blends of natural and synthetic fibers, Heavy for denim, corduroy or canvas. Place aluminum foil under fabric before applying Unique Stitch to prevent seepage onto work surface. 1 1/4 fl. oz. Transparent adhesive repairs cuts and tears in vinyl, leather and fabric. Use on shoes, hand bags, vinyl upholstery. SMALL CUTS or TEARS-Squeeze a small amount on to vinyl or leather surface. Spread evenly over cut with tip of tube. CAUTION-to prevent excess of Instant Vinyl showing squeeze adhesive on to wax paper or aluminum foil and spread on to cut with a toothpick, spreading adhesive under and between the tear.LARGER CUTS-Follow directions for small cuts and in addition-if cut is large, insert piece of scrap vinyl. The purpose of the backing vinyl is to prevent Instant Vinyl sinking into stuffing. Apply Vinyl to vinyl insert, edges and sides of cut. Press down on area to smooth out vinyl. Apply masking tape perpendicular to tear to bring edges tightly together while Instant Vinyl is drying. Allow 30 minutes cure time. Remove tape. If repair has depression, apply thin line of Instant Vinyl to fill-no tape necessary.Coverage can be smoothed with finger. CAUTION-Keep out of reach of children. Use with adequate ventilation. Avoid prolonged breathing of vapor. Avoid contact with eyes and skin. Keep away from heat and open flame. Keep container closed when not in use. EYE CONTACT-flush repeatedly with water. IF SWALLOWED-give 1 or 2 glasses of water or milk,induce vomiting and call physician. EXTREMELY FLAMMABLE VAPOR Barge rubber cement is handy to have around the house. It will patch the Northerner rubber boots and will stick just about anything together. Keep a tube around and you'll be surprised how much you use it E-6000 Craft Adhesive has been manufactured and sold as a high-performance industrial adhesive for over 25 years, E-6000 became a hit in the craft market with its superior performance, flexibility, and versatility. 120-240 volts 40 watts ADD A BIT OF BLING TO EVERYTHING!! • Perfect for slick to porous surface applications. 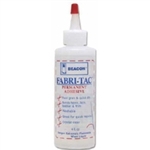 • Great for bonding lace, fabrics, trims, and decorative wire to glass, ceramics, patent leather, wood, vinyl, leather, and more. • Excellent for attaching rhinestones, gems, mirrors, pearls and other embellishments to a wide variety of materials. • Permanent, water-based, non-toxic and washable. • Requires only a small amount to hold; dries clear. • Creates wonderful wearables, gifts, home décor, and can also be used for general household repairs. HELPFUL HINTS • Poke a hole in applicator tip with a large paper clip to release a more precise line of glue. To cover larger surfaces, snip tip near top. • For easier application, use a "tip" pen point (available in craft stores) that screws on to tip and allows greater control over the amount of glue. • Easily cleaned with water when wet. Remove dried Gem-Tac from clothing by dry cleaning. • Requires only a small amount to really hold; position item gently (NO PRESSING HARD) to prevent oozing or soaking through. • Gem-Tac's unique formula actually gets STRONGER when exposed to heat from the dryer. • Always pre-wash fabrics to remove sizing; clean slick surfaces before applying Gem-Tac. • Do not use on metal as rusting may result. Do not freeze. THE GLUE GUN IN A BOTTLE! • Permanent, fast grab, quick drying, crystal clear, and washable. • Bonds fabric, wood, leather, lace, suede, tile, felt, pearls & gems (except for those with a silver coating on back) plaster, glass, trims, canvas, ribbons, hats, & much more. • Won't stain or soak into fabrics. 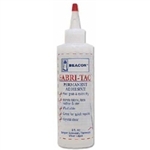 Perfect for hems, seams and other clothing repairs. Prevents fraying and maintains its strength through countless washings. • Ideal for creating dolls, pillows, stuffed animals, wreaths, dried floral arrangements, picture frames, ornaments, gift and jewelry boxes, lampshades, upholstery, drapes, handbags, shoes, bridal headpieces, party favors, and many other projects. • Great for general household and yard projects and repairs. • Easier to use than a glue gun . . .no heat, mess or inconvenience. HELPFUL HINTS • Poke a hole in applicator tip with a large paper clip to release a more precise line of glue. To cover larger surfaces, snip tip near top. • Apply a small amount of Vaseline to top of dispensing tip to reduce stringing. • Always keep top covered to prevent evaporation. If red tip is lost, just cover the bottle opening with plastic wrap and replace cap to prevent glue from drying out. • Thin with acetone. Do NOT use nail polisher remover as it may discolor glue.Add acetone drop by drop, stirring, until desired consistency is achieved. • Never use fine furniture as a work surface even if protected as the acetone fumes will attack the finish. • Make sure all work surfaces are properly covered when using. • Pre-wash all fabrics to remove sizing before applying glue. Sizing prevents glue from thoroughly penetrating fibers. Some metallic threaded fabrics might require two washings. • Not suitable for applying patches to fabrics as patches have a coating on back that prevents glue from absorbing into the fibers. • Dry clean to remove glue from garments. Depending on fabric and how much glue was used, more than one cleaning may be necessary. • Glue is designed to bond to the top fibers of the fabric and should not be "pushed" into the garment as stiffening will result. • Flammable only when wet and should never be applied near an open flame. Once dried, there is no danger of flammability. • Always use with proper ventilation. • Not suitable for use on Velcro, denier nylon, or very sheer and delicate fabrics where glue might soak through. • Glue dries very fast. Work in small 1-3" areas to prevent glue from drying too rapidly. • If glue separates after washing, garment was not properly pre-washed to remove sizing, glue was allowed to dry before adhering, surface did not allow glue to penetrate fibers.